We’ve teamed up with Whole Foods Market UK to bring you an in-store monthly Craft Chocolate Focus, where every month we’ll be showcasing a new theme. For the month of March, we’re delighted to showcase Rozsavolgyi Csokolade, a Hungarian chocolate maker – and the latest chocolate of ours to reach Whole Foods Market. Rozsavolgyi Csokolade is a Hungarian chocolate maker based in Budapest, founded by husband and wife team Zsolt Szabad and Katalin Csiszar in 2004. Rózsavölgyi translates from Hungarian to ‘rose valley’, and we think that this name delightfully conjures up a vision of aromatic beauty that is perfectly in keep with Zsolt and Katalin’s chocolate bars. Their bars are also moulded to look like traditional fireplace tiles and further hand wrapped in beautiful craft paper. Their approach to chocolate making is a simple but highly effective philosophy of combining local ingredients with lightly roasted cocoa beans and extensive refinement and conching. The result is a wonderfully smooth chocolate that enhances the natural flavours of the beans. At Whole Foods Market, expect to find the flavours of Matcha Tea, Black Sesame, Peppermint, Caradmom and Hot Paprika. Coffee and chocolate are the best of friends and a great gift either for your loved one or to share this Valentines. We’ve teamed up with the team at Square Mile Coffee Roasters to present this delicious pairing of Chocolat Madagascar 70% dark chocolate and our La Piramide coffee from Colombia. This fruity bar is a perfect example of Madagascan dark chocolate. Most of the cocoa grown in Africa is exported once it’s been fermented and dried. Chocolat Madagascar is one of the relatively few companies that both grow cocoa and make chocolate bars in Madagascar. Slight spice up front which gives way to sweet raisin and forest fruits in the finish. The La Piramide is from the municipality of Inzá in the Cauca region of Colombia. Sweet toffee features prominently in the cup with cloudy apple notes and an elegant honeysuckle note to it, which we think pairs incredibly well with the fruity, berry chocolate in our opinion. This gift set is available for just £18 on via the Square Mile Coffee Roasters online store. We recommend buying before midnight on Monday 11th February for delivery to UK addresses in time for Valentine’s Day. Earlier this year we were delighted to spend time with the expert tea tasters from Whittard, tasting their fine loose leaf teas and sharing some of our favourite bars. It was fascinating to learn so much about the origins of different teas, and all the care and attention that goes into preparing the perfect cup. Perhaps it was inevitable that we would eventually find ourselves trying out different pairings of teas and bars. For those looking for a more robust taste to their green tea, this famous variety from China’s Hunan Province might be just the ticket. The elegant blue-grey leaf takes its colour from the silvery buds picked early in the spring, while the infusion itself produces rich, roasted notes and a vibrant nutty complexity. There’s even a floral sweetness to the finish, far from the bitter, tannic taste which you might associate with lesser green teas. The name itself is a reference to the quality of the leaf: ‘Mao’ refers to the youthful, downy quality of the barely opened buds, while ‘Jian’ refers to the peaked tip of the young leaves, delicately picked and gently rolled by hand. Ba Ria is a rich and fruity chocolate, made with beans from the Bà Ria province of south eastern Vietnam. This bar is a sublime and intense chocolate experience that tastes as good as it looks. This is the kind of chocolate that makes you look twice at the ingredients to see where the intensely fruity flavour is coming from. Of course, there are no added flavours, and the deep, red fruit notes in this chocolate come entirely from the south Vietnamese Trinitario cocoa beans. Keemun Mao Feng – aromatic notes of sweet plum and smoked pinewood. This smokey pairing brings together a Keemun from China and a dark chocolate from The Solomon Isles. One of our most prized Chinese teas, we’ve sourced this exceptionally high grade of Keemun from Anhui Province, the home of Chinese black tea. While ‘Keemun’ refers to the region of ‘Qimen’ where this tea was first produced using specialist techniques learnt in AnHui, ‘Mao Feng’ gives a clue to the superb quality of the young spring leaves. Skilfully picked and processed by hand, the result is an extraordinarily smooth, plummy sweetness, tinged with a subtlest touch of Lapsang-style smokiness. Comparable to a fine Burgundy in the tea-tasting world, this is the sort of tea connoisseurs dream about. We’d recommend using slightly less leaf, brewing lightly and drinking without milk to bring out the notes of plum, black pepper and smoked pinewood. Perhaps one of the most interesting chocolate phenomena, this ‘smoked chocolate’ note is something we are seeing more of. There are a number of cocoa-producing islands in the South Pacific and many of the bars that hail from them have a similar profile. At the same time, each different plantation and islands’ own micro-climate has a huge impact on the beans’ flavour. So far Solomons Gold has the most pronounced smokiness of any bar we’ve tasted. This is a seriously intense and savoury dark bar. The chocolate has little to no fruit but instead is infused with a seriously smokey aroma. The flavour is not so much nutty or roasted as a big blast of wood smoke. Imperial Puerh – Strong and earthy, yet clean and refreshing. 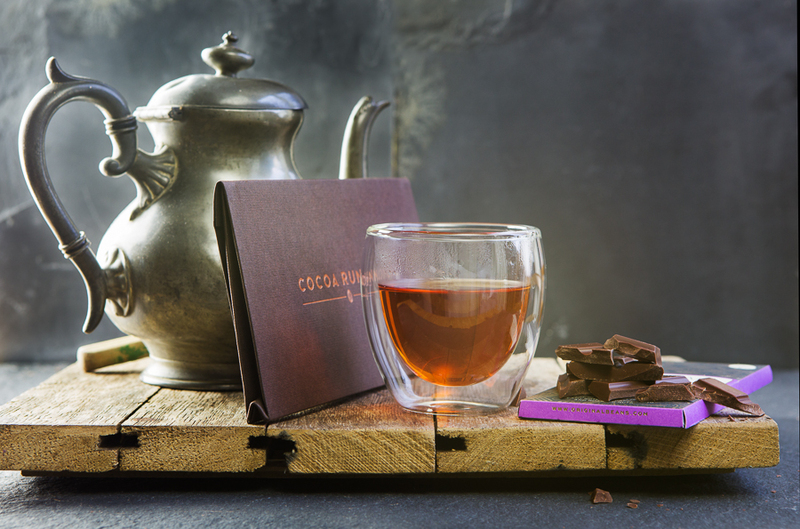 This pairing brings together a fine Puerh from China and a dark chocolate from Ecuador. Our Imperial Puerh is a particularly fine variety from the home of puerh tea, Yunnan Province in China. 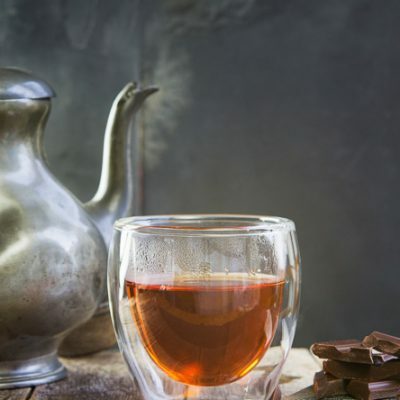 Unlike many lesser quality puerhs which tend to be heavy and musty, this is a clear-tasting and richly flavoursome tea, substantially full-bodied without a hint of heaviness. You’ll find the earthy notes are beautifully balanced by a fresh, clean sweetness, and the result is surprisingly refreshing. There’s no tea quite like puerh. 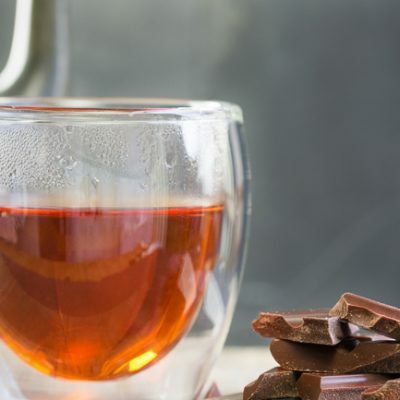 It’s the only tea to be fermented alongside the usual oxidation process using healthy microbes and microflora: the bacteria required for a healthy digestive system. As a result, puerh has long been viewed as an aid to digestion and weight loss – over the centuries, it has been claimed to reduce cholesterol, combat ageing, reduce the risk of heart disease and help with circulation, to name but a few of the reputed benefits. However, a good puerh is far more than just a medical brew. The unroasted dark chocolate has an earthy green flavour and unusual grainy texture. The Ecuadorian nibs give a satisfying crunch bar and further bring out the wooded vegetal notes in the chocolate. The hints of salt give a distinctive contrast, refreshing the palate. 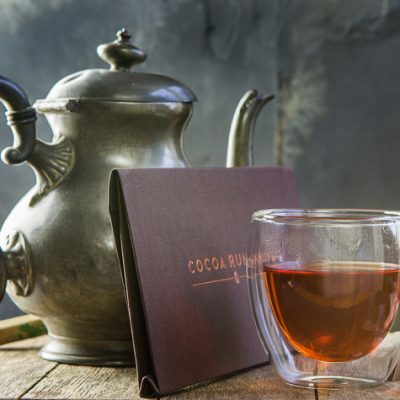 Ecuadorian cacao is known for its earthy profile, and tasting this alongside the highly aromatic yet earthy Puerh makes for a satisfying and somewhat savoury pairing. Meet The Pigeonhole: Serialised, Social and Interactive. Charles Dickens once said “There is nothing better than a friend, unless it is a friend with chocolate.” Here at Cocoa Runners, we would like to add a small addendum to this statement: “There is nothing better than a friend, unless it is a friend with chocolate … and a good book”. Sharing stories is key to the human experience. For generation after generation, sharing stories in their various forms has helped to foster a sense of community. For thousands of years before the conception of the printing press, the oral tradition of storytelling was one major hallmark of the human experience that transcended cultural and technological boundaries. In time, the increased availability of printed works helped to solidify the narrative of many stories, in reality, books were expensive and comparatively inaccessible. As a consequence, publishers sought alternative ways to bring their authors’ works to the public, and alighted upon serialization in newspapers and periodicals as more accessible media. This steady release of staves allowed readers around the world to enjoy new works from authors such as Leo Tolstoy, Harriet Beecher Stowe, Sir Arthur Conan Doyle, Alexandre Dumas and Charles Dickens himself. It allowed them to read stories day by day, week by week or even month by month alongside their friends. Its easy to see how the measured release of stories would lead to early versions of ‘water cooler moments’, with people eager to share their thoughts on every twist and turn of the plot as it came. As books became more affordable, and publishers started to move away from this format. And the water cooler moments were instead owned by visual media. But in the past year or two something has changed. Streaming services started to provide whole seasons at once for us to binge watch over a weekend. And it started to feel that in this age of instant gratification, the art of patience, and the thrill of anticipation may be lost to us forever. It seemed that bitesize story telling looked set to become a lost art. The recent growth in popularity of podcasts that tell stories week by week and month by month, has brought about a resurgence in serialisation. And we understand why. Much like a bar of carefully crafted chocolate, a good book deserves to be savoured. While cheap chocolate bars are designed to be devoured and leave you wanting more, a just a square of a top quality bar will leave you sated. Each time you carefully wrap the bar up, knowing that it’s there to look forward to, at the same time tomorrow. By the same token, while it’s tempting to plough though a whole book over a rainy weekend, it can be just as enjoyable to savour it a chapter at a time to brighten up a dreary commute. Here at Cocoa Runners, we believe that great books, like great chocolate bars, deserve to be shared. As voracious consumers of stories in their many forms, we often share tips as to the latest must read book. Indeed, there have been times when our admiration for a certain book as been so ardent that we rush in of a morning, desperate to share our thoughts on the latest twists and turns of a story over a square or two of a fruity Madagascan bar. But there are times when disaster strikes. One of us has a habit of leaving their books in cafés, and another all to often breaks the code of honour and reads several chapters ahead… Which is why the discovery of The Pigeonhole was so fortuitous. This nifty app – currently one of Apple’s ‘best new apps’ – allows you to set up a group with your friends, choose a book, and read it together in bite sized instalments. We were a little concerned that we wouldn’t be able to fold corners and bookmark our favourite parts as we went along, but we needn’t have worried. The app allows you to save off your favourite parts, and actually add your notes as you go, so that fellow readers can chime in and see if they agree. 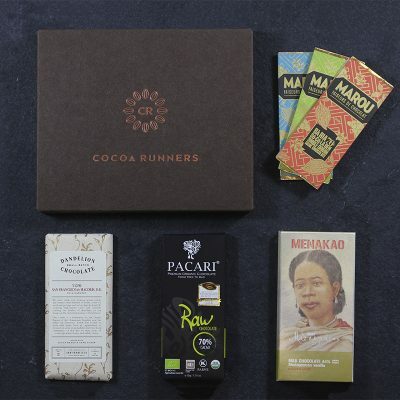 The kind people at The Pigeonhole have a special offer for Cocoa Runners subscribers this Mother’s Day. If you buy the Mother’s Day Collection, you will receive a digital book from The Pigeonhole for free. You can use the code for any book in their library, but if you’re reading along with your mother, The Pigeonhole recommend Angela’s Readman’s Don’t Try This At Home – a collection of some of the best short stories you’ll ever read. Designed to be savoured a stave at a time, they’re the prefect accompaniment to a square or two of craft chocolate. Mother’s Day is a chance to celebrate family and spend time with your nearest and dearest. So this Mother’s Day we have decided to support a fantastic charity, Willow Foundation to give more families a chance to spend quality time together. Willow is the only national charity working with seriously ill 16 to 40 year olds to fulfill uplifting and unforgettable Special Days. For some their Special Day is the opportunity to return some normality to their lives. For others it is the last chance to fulfill a dream. But for all, it is a life-affirming experience that can lift spirits, reunify families and be a source of strength when it’s needed most. To date, Willow has provided 12,000 Special Days for young adults diagnosed with a life-threatening condition such as cancer, motor neurone disease, cystic fibrosis and Huntington’s disease. Willow was founded in 1999 by former Arsenal goalkeeper and TV presenter, Bob Wilson and his wife, Megs, as a lasting memorial to their daughter, Anna, who died of cancer aged 31. Anna battled her cancer for five years but it was during these years that she, her family and friends, experienced some of their most memorable moments together. Her self named ‘Special Days’ became a focus for quality of time and quality of life, providing a welcome distraction from the challenging realities of living with a serious and life-threatening illness and restoring some normality back into all their lives. Willow has aimed to replicate the benefits of Anna’s ‘Special Days’ by providing similar positive, motivating and uplifting experiences for other seriously ill young adults. For every Mother’s Day box we sell, we will be donating £1 to the Willow Foundation to help them continue their great work. This year for Mother’s Day we bring you a tasting flight of bars from around the world to delight your mum with. 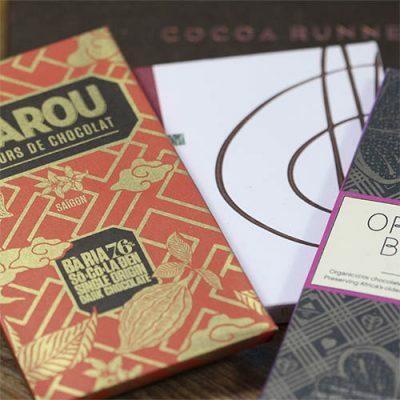 We’ve included three mini dark bars from Marou, two full sized dark bars from Pacari and Dandelion as well as a full sized milk chocolate bar from Menakao. With such a range of chocolate types, and origins there is enough delicious chocolate to satisfy even the most demanding mum. Every mum deserves the best, and that’s exactly what these craft chocolate bars are. Made by different makers across the world, each has been handmade from the bean in small batches. Unlike mass-produced chocolate, these artisans makers lovingly craft their chocolate bars with a huge attention to detail. Using just a few simple, high quality ingredients, they focus on getting the best possible flavours from the cocoa beans. With this collection, your mum can discover for herself the tastes and flavours of craft chocolate. Not only do these craft chocolate bars taste great, they look good too. The distinctively packaged bars are nestled in tissue paper and wrapped in a Cocoa Runners embossed gift sleeve. To view the collection, click the button below. We also encourage you to visit the Willow Foundation’s website. Here you can see case studies, find out more about the great work that the charity does and see how you can get involved! The secret to a truly spectacular Valentine’s Day is decadent chocolate. But this year many of us are looking at a whole Valentine’s weekend – which is plenty more time to fill in. To make things easier, we’ve put together a list of great date ideas and gifts that are sure to impress your date and put you securely in their good books. Looking to impress with a show-stopping meal, but don’t want to spend hours in the kitchen? Swap hours of toiling behind the cooker for carefree cooking and a guaranteed smile on the other side of the dinner table. Simply Cook sends you neat recipe cards, spice mixes and handy shopping lists, making cooking a breeze even for the novice chef. It gets better: all four dishes can be mastered in just 30 minutes. Toss together a sharing platter of fiery churrasco Portuguese chicken along with spiced wedges and aioli. Heat things up with a luxurious but simple pasta. Cherry tomatoes, wild garlic, rosemary and chorizo with a special red pepper sprinkle to garnish. Go east with a yummy coconut curry featuring cardamom, cumin and citrussy lemongrass, galangal and ginger. The sweet and sour flavours in this Vietnamese dish will take you on a taste sensation rollercoaster while the lightness will ensure there’s room for a dessert of craft chocolate. Wine’s not your thing, but still want something finer in the glass to mark the occasion? Check out Honest Brew. In the same way we discover and share chocolate, they discover and share beer. And not just any beer. 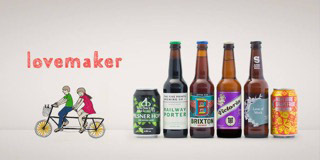 They curate monthly boxes of the best craft ales and lagers out there, tailoring to each member individually. Honest Brew have designed a special edition Valentine’s Day box and with twelve bottles there’s more than enough beer to keep you and your date happy all night long. Share the Love Maker mixed case with your one true Valentine – they’ve included two bottles of each beer so there’s no fighting over who gets what. And to sweeten the deal a little more, you get two Honest Brew glasses to make the day extra special. No meal is complete without wine. Vinoa is a great way to discover artisan wines at affordable prices. Their wine tasting subscription lets you taste wines before buying them. You can also order a one-off box and organise an intimate five-star tasting in the comfort of your own home. Tasting notes are included to perfect your evening. Fancy a full-size bottle to go with your Simply Cook meal? Get this Syrah for the Churrasco chicken, Sangiovese for the chorizo rigatoni, Grüner Veltliner for the Thai Beef Massaman, and the Chenin Blanc for the Vietnamese Ca Kho To. You can order just a single bottle, but we always order in cases. These bottles make a great gift either just for yourself or for sharing with your date. Remember, there’s still time to order Cocoa Runners Valentine’s collection. There’s no need to plan a dessert when you’ve got some of our best bars stashed away. What better way to wrap up Valentine’s Day than share a bar or three of rich craft chocolate with your lucky date?